If you’re looking to create a striking patio, pool deck, walkway for your home or business, or driveway look no further than pavers. Also known as paving stones, these small bricks interlock to create beautiful patterns. There are myriad advantages to using pavers. Not only do they look great but they’re strong as well, and they can handle a good deal of pressure. Plus, if they get damaged it’s generally as simple as replacing a single paver. As such, they’re ideal from an economic standpoint as well. There really are no cons to using pavers. It’s all about the kind of aesthetic you’re going for. They’re Durable: Because they’re made of brick, pavers can withstand a great deal of abuse without difficulty. It’ll take a lot to seriously damage one. They’re absolutely ideal for areas that get a lot of foot traffic as they take an extremely long time to wear down but put them anywhere really and they’ll be just as effective. 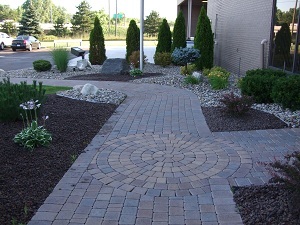 They’re Versatile: You can use pavers for a very wide range of applications. Do you want to install a new driveway but not pay for all of that costly asphalt? Pavers can be a great solution. Because they’re so tightly interwoven your tires will not be in any danger. Want to create a new walkway through your yard? You can walk comfortably on brick pavers all day. Need some edging around your patio or garden? Brick pavers can do the job admirably. They Look Great: Put simply, brick pavers have a beautiful aesthetic. Color differences in the bricks and the freedom of the layout create the opportunity for beautiful, distinctive patterns. Most will be very pleased with their look. They’re Resilient: Not only are pavers durable, they can stand up to a great deal of environmental pressure as well. They deal extremely well with the burdens that come with inclement weather. As such, they’re a good choice for areas which receive a lot of precipitation or snow. They’re Easy to Maintain: Because so little can damage pavers they’re extremely easy to maintain. In fact, they’re essentially maintenance free. If you want them to require even less maintenance you can seal them to prevent staining. They’ll likely need to be resealed every couple of years. Of course, you might not need to seal them at all, but if you’re going to barbeque in the area you really should. Otherwise, all that’s needed to clean brick pavers is a bit of detergent and water. 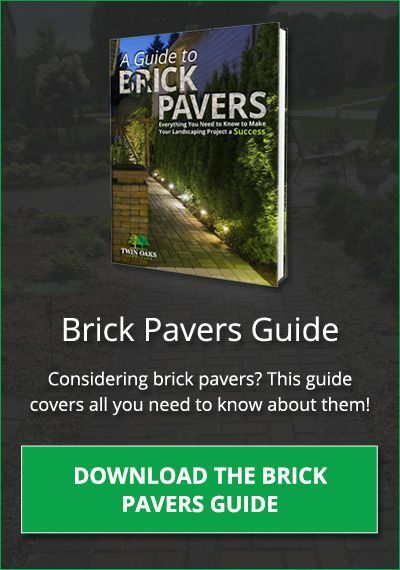 They’re Easy to Replace: Should one of your pavers become damaged replacement is easy. Rather than removing and reinstalling a large area of flooring all, you’ll need to do is remove that one paver and put another in its place. 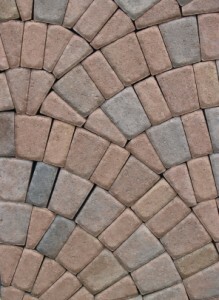 Pavers are quite inexpensive, and as such so are replacement costs. But maybe you’re having issues of a more pressing nature. Maybe you have a slope that is eroding or would like to have a patio in an area which is not currently level. A retaining wall can be a solution to these and many other landscape “problems”. Retaining walls can be constructed out of precast concrete products, natural stone or wood. Plus, if you do not have an area to retain, but still like the look of a wall, there are many products that can be utilized for free standing walls. These can be purely aesthetic or serve a function such as a seating wall or a raised patio or bed. At Twin Oaks, we value doing business with local companies, and in applications where their products are best suited we proudly recommend a few companies whose products can make your hardscape standout and look beautiful. Many are featured in our gallery. When designing your project we will guide you to choosing the best material for your design based on the site characteristics, aesthetics of your home and your budget. At Twin Oaks we always go beyond ICPI standards, ensuring that you’ll be able to enjoy your new hardscape for years to come. Our project manager and foremen have years of experience and training, and we are proud to have such skilled staff to stand behind. No matter what you require, Twin Oaks will perform their duties with professionalism and skill. Contact us today for a free estimate on a new hardscape for your property.